In September 1940, No.7 Squadron joined the No.3 Group from No.4 Group. Re-formed in August 1940 at Leeming, No.7 became the 1st Squadron in Bomber Command to be equipped with the Short Stirling 4-engined Bomber; by early 1941 the Squadron had moved to Oakington. The Pathfinder Force, which 7 Squadron had joined in August 1942, became No.8 Group in the January of 1943. Its Policy was to have 2 Squadrons per Airfield. At Oakington 7 Squadron, which was being re-equipped with Lancasters to replace the Stirling, was joined by 627 Squadron formed with the Mosquito. The latter Squadron moved to No.5 Group in April 1944 being replaced by the newly formed 571 Squadron. Oakington will always be the spiritual home of 7 Squadron yet the Squadron was based there only from October 1940 to July 1945 but being unique in Bomber Command having been based at the same Station throughout its WW2 Operational Career. Construction of Oakington began in the summer of 1939 – the site, some 5 miles North-West of Cambridge, having been selected for an expansion scheme Airfield. Operational use started in July 1940 when it was used for 218 Squadron (2 Group), which had recently returned from France, with the 1st Offensive Operation in August 1940. In September 1940 Oakington became part of 3 Group when it was chosen as the Base for the 1st Stirling Squadron – 7 Squadron. 218 Squadron left Oakington in November 1940 so that 7 Squadron could have more space. Then in November 1940 Spitfires of the recently formed 3 Photo Reconnaissance Unit arrived – however because of the poor surface during the winter months the Spitfires frequently used Alconbury. Oakington’s Grass Surface was also the cause of problems for the Heavy Stirlings during the winter of 1940/1941 – there were a number of Landing & Take-off accidents because of the strain put on its undercarriages. Oakington was 1st used by 7 Squadron for an Offensive Mission in February 1941 to attack Rotterdam Docks. Extraordinarily, the 1st Stirling & Halifax Heavy Bomber Squadrons were expected to operate from turf-surfaced Airfields. This was not a problem in Summer, but these 30 tonne Giants rutted and churned up Runways at other times of the year and were often bogged down. No 7 Squadron at Oakington was the 1st with Stirlings and suffered with unsuitable surface conditions for many months until Concrete Runways were laid. Until sufficient Concrete Hard-standings were available, the Stirlings at Oakington were lined up on the out-of-use Runways for Bombing-up, as in this Photograph below taken in March 1942. W7466/MG-B, with Pilot Officer M R Green & Crew, on the left failed to return from its 6th Sortie, the Lubeck Raid later in the month, crashing at Gnutz. The MG Sports Car sobriquet is appropriate Transport for Members of this Squadron! Because Oakington was frequently unserviceable it meant that the Stirlings had to fly to Wyton to Bomb-up for Operations. In the Spring of 1941 Runway Construction began – the Main Runway 05-23 & 1700 yards long was completed 1st with 01-19 (1300 yards) & 10-28 (1400 yards) completed over the next 12 months. 05-23 was subsequently lengthened to 2000 yards & 01-19 to 1530 yards. Subsequent building work included realigning the Perimeter Track and expanding the Domestic Accommodation to allow for nearly 2000 Personnel. The Pathfinder Force, which 7 Squadron had joined in August 1942, became No.8 Group in the January of 1943. Its Policy was to have 2 Squadrons per Airfield. At Oakington 7 Squadron, which was being re-equipped with Lancasters to replace the Stirling, was joined by 627 Squadron formed with the Mosquito. The latter Squadron moved to No.5 Group in April 1944 being replaced by the newly formed 571 Squadron. August & September 1942 would see No.3 Group’s strength almost halved when No.7, No.156, & No.109 Squadrons were Posted-out en masse to help form the newly created No.8 Group – the celebrated Pathfinder Force. However, No.109 & No.7 Squadrons would remain Affiliated to No.3 Group for a Period. The provision of Aircrew for these 2 Units would initially be meet by No.3 Group, as would all Administration. The Pathfinder Force was renamed No. 8 (Pathfinder Force) Group on 13 January 1943 and disbanded on 15 December 1945. With the end of the Conflict, 7 Squadron moved to Mepal, 571 Squadron to Warboys with Oakington now becoming part of Transport Command. During the summer of 1945, it was the Base for 86 & 206 Squadrons flying ex-Coastal Command Liberators for long-range Troop Transport to the Far East. After these Squadrons were disbanded in April 1946 a series of other Transport Squadrons occupied Oakington. It was then taken over by Training Command towards the end of 1950. Eventually, the Army took the Station over as a Barracks. The final Regiment to occupy the Camp was the Royal Anglian Regiment which moved out in 1999. The Fate of ND744 MG-F Op: Valenciennes. T/O 23.19 Oakington to Bomb Railway Yards. Crashed near Arras (Pas de Calais), where those who died are buried in the City’s Communal Cemetery. Bill Andrews Power made his 1st Cross-country Flight with Flight Sergeant Sykes on the 31st March at 1900 hrs in Halifax KN-X. (77 Squadron) His 1st Operational Flight was on the night of the 9th April 1944. They took off at 21.00 hrs in Halifax KN-A to bomb the Lille-Délivrance Goods Station. 239 Aircraft took part in that Raid from various Squadrons & only 1 Lancaster was lost. Their next Raid was on the following Night, again take off time was 21.00 hrs and the Target was the Railway Yards at Tergnier. 157 Halifax’s of No.s 4 Group & 10 Pathfinder Mosquitoes took part in this Raid. 10 Halifaxes failed to return. They Laid mines off Heligoland on the 12th April, and off Malmo on the 18th. 122 Halifax’s of No.6 Group with 10 Pathfinder Mosquitos to Ghent in Belgium (No losses). With the exception of the Raid at Laon, all the attacks inflicted heavy damage on their intended Targets. 341 Lancasters & 11 Mosquitos of No.s 1, 3, 5 & 8 Groups dispatched to Aachen. 9 Lancasters lost, 2.6% of the Force. This Raid was accurate and caused widespread Damage & Fires in the centre of Aachen and in the Southern part of the Town, particularly in the suburb of Burtscheid. This was Aachen’s most serious Raid of the War. Control of the Air-Raid Services was quickly lost when one of the 1st Salvo’s or Bombs cut Communications between the Main Operations Centre & Outlying Posts. 171 Aircraft – 139 Halifaxes, 24 Lancasters, 8 Mosquitos of Nos 3, 4 & 8 Groups – to Tergnier. 6 Halifaxes lost. 50 railway lines were blocked but most of the Bombing fell on housing areas South-west of the Railway Yards. Cologne: 357 Lancasters & 22 Mosquitos of Nos 1, 3, 6 & 8 Groups. 4 Lancasters lost. This concentrated attack fell into areas of Cologne which were North & West of the City Centre and partly Industrial in nature. 192 Industrial premises suffered various degrees of damage, together with 725 buildings described as ‘dwelling-houses with Commercial premises attached’. 7 Railway Stations or Yards were also severely damaged. Düsseldorf: 596 Aircraft – 323 Lancasters, 254 Halifaxes, 19 Mosquitos – of all Groups except No.5. 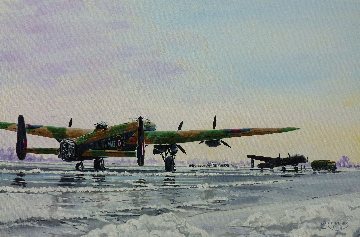 29 Aircraft – 16 Halifaxes & 13 Lancasters – lost, 4.9% of the Force. 2,150 tons of Bombs were dropped in this old-style heavy attack on a German City which caused much destruction but also allowed the German Night-Fighter Force to penetrate the Bomber Stream. The Attack fell mostly in the Northern districts of Düsseldorf. Widespread damage was caused. 493 Aircraft – 342 Lancasters, 133 Halifaxes, 18 Mosquitos – from all Groups except No.5 despatched to Essen. 7 Aircraft – 6 Lancasters, 1 Halifax – lost, 1.4% of the Force. The Bomber Command report states that this was an accurate Attack, based on good Pathfinder Ground-marking. The fate of ND845 MG-C. On Friday, 19th May 1944, (a part of) the Aircraft of the 7th Squadron (RAF), took off for a mission to le Mans in France from a Station (airfield) in or near Oakington. One of the Crew members was Flight Sergeant D W Wood. He departed for his Mission at 22:22. He flew an Avro Lancaster (type III, with serial ND845 & code MG-C). His mission and of the other Crew members was planned for Saturday, 20th May 1944. Possible collision. Hi. – I am wondering if you can help me with any info regarding Lancaster JB155, MG-G of No.7 Squadron .lost with all Aircrew in November 1943. The Pilot was Sqn Ldr Eric Hugh Montgomery Nesbitt. I have the original Telegram advising his father of the Sqn Ldrs loss…I really would like to trace a picture of the man and as much info as possible and see if he has Surviving Relatives so I can return the Telegram to them. Aircrew Remembered Website may be able to help with contacts. There are no images on the site but the relatives likely retain such.